History Gas Services Offshore Ltd. In 1981 ex-US Navy diver Don Rodocker established a company called Gas Services Offshore Ltd in Aberdeen. Don brought together British inventor, Alex Copson’s Helinaut valve with his Gasmizer reclaim system to provide the first practical heliox recovery system. The company became well established in Westhill, only 50 metres from the site of the current Divex headquarters. Divex, originally a US based company as well as Gas Services Offshore Ltd (and other companies) were all purchased in the early 1980’s to form the ‘Pressure Products Group’. Since the manual which came with this Helinaut helmet is dated 1987 and is signed with the Gas Services logo this indicates that in 1987 Gas Services still operated under its own name. See also Divex in the US Chapter. How are you? I have just returned to my ship last week, (DSV Deep Arctic) we are working off Libya for a few months. Anyway, I was looking at your website, and noted a picture + description of a Gas Services band mask. Actually, it reads a little wrong, perhaps? I am sure you recognise that it is based on a Kirby Morgan 18b band mask, that's how they started off. They were not made only in limited quantities for the Seaway Pelican, in fact, most were not actually specifically "made" at all. They were simply "Converted" from regular KM18b band masks. You see, General Diving Systems (Alan Krasberg) was selling his Superflo Kirby Morgan based reclaim helmets for 9,000 pounds at the time Gas Services started trading in 1981. 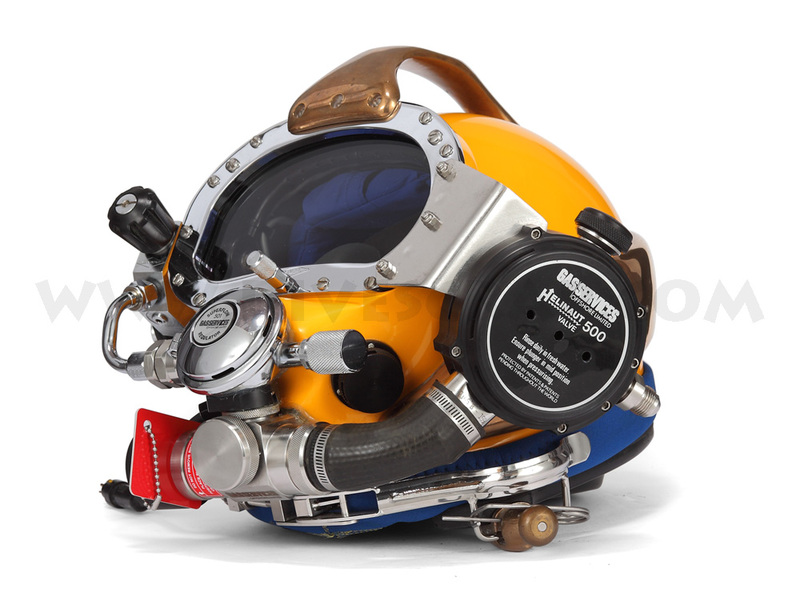 Gas Services did not lay out the money to buy a stock of helmets and band masks to convert, instead, Don Rodocker would invite management from various Diving Companies, and explain to them that he was not trying to have them buy new helmets and masks and dispense with their existing ones, but instead. Gas Services would convert a KM17 (helmet) or 18 (mask), for the same price of exactly 1,500 pounds. I was present at one of those discussions, it made sense to the people who were contemplating buying Gas Reclaim topsides units (for 50,000 pounds instead of 90,000 pounds) and converting their own helmets/masks for a 1500 conversion fee. We had those 18b Gas Services Reclaim masks, for example, with Taylor Diving & Salvage on the Brown & Root 318 in the Persian Gulf, then with Wharton Williams (2W) on Deepwater One & Deepwater Two (latterly called Rockwater One & Two) and that was from 1984 onwards, and we were not the first ships to have them. The first time Gas Services Gas Reclaim was used commercially was 1981 on OSA Stephaniturm, for the HMS Edinburgh gold recovery salvage. Those were definitely 17b helmets, far too cold to contemplate band masks. The first ones had a Bolt on divertor block assembly, plus the actual Helinaut exhaust valve (back pressure regulator on a bracket). The demand valve exhaust was obviously no longer going to exhaust directly into the sea, so the oval lip which is usually for the exhaust (bubble whisker) was removed (2 screws on early valves) and an adaptor fitted in it's place to attach it to the divertor block assembly. The whole arrangement was identical in every way whether it was fitted to a 17 or an 18. I couldn't put a date on the time when Gas Services developed their own version of a balanced 2nd stage (demand valve) I would have to ask other people about that, but the early Gas Services reclaim helmets and masks which we had, were all still fitted with the regular KMDSI Superflow demand valve. These days, the early Superflow, with the smaller inlet ports, are classed as being restrictive, but I have dived them at 170 fsw on air and they were fine by me ! I hope you're doing well David. When working on one of the last chapters in my book: on the Dräger DM 200 / CCBS deep diving helmets I started looking also for info on the competition from these days. A famous competitor to the Dräger CCBS was the Helinaut which was sold by ‘Gas Services’ (now Divex) in Scottland. By sheer luck I came across an old email which once landed in the mailbox of this website, an email which sheds an interesting light on the Helinaut history... Back then in 2013 when I received this email a brief exchange of emails had followed with Ivan, the man who sent this email to me and we left it at the point where he promised to send me a lot of evidence by mail. This evidence never arrived and I completely forgot about it. and I hereby give you full rights to use this information on your website since this and other information forms part of a publication soon to be released:- I have numbered the paragraphs should you have any queries. On your website you question why is it difficult to find the history of the Helinaut valve, and its inventor, or anything about Alex Copson. This is the case because Copson knowingly and deliberately breached my copyright. You will not find much on the Internet about Alexander George Copson because he stole the valve design from me in January 1977 and has kept his head down ever since. Don Rodocker joined him in Gas Services which later became Divex. Divex continues to be a thriving business on the back of my design to this day and falsely claim Copson as the inventor when they are severally, knowingly, guilty of continuing the same breach of copyright. The reason you will not find much about Copson is that he committed at least two indictable offences, which are not time limited. The first offence was submitting his name as the inventor of my conjoined valve in his complete specification to the Patent Office, which contained two copies of my designs. The second offence was the assignment the patent to Gas Services on 14th September 1982. However, I was informed by the Patent Office that although they issued a patent they did not add the conjoined valve illustrations published as the last two pages of patent number GB1578016. They went on to say that both designs are still my copyright and are still covered by the 1949 Copyright Act., therefore, there should not have been a Helinaut valve or 603 valve which is the Divex second copy of my concept. I had started to retrain myself as a college lecturer and teacher. I intended to teach full-time at secondary level, when my disability worsened. I could teach FE level in college full-time, which would be half the hours. I had commenced with an IT and Graphic design qualification, and I had completed the first year exams which then required 250 hours proven drawing-board practice to qualify for the next two-years of my course. To achieve this I took 1976/7 out from college and applied for the junior draughtsman post advertised by Trimay Engineering Ltd which gave me more than 1500 hours of drawing-board practice allowing my return to college. Peter Hamilton-Davis and Alexander George Copson were listed as directors of Helinaut Ltd and a D.F.Evans named as consultant in the company. I was made aware several months later that Peter’s step-father Mr. Stuart Underwood MD of Trimay Engineering was financing the building of the Helinaut gas reclaim unit with Trimay purchasing all of the components. The idea of gas recovery was certainly not a new idea at that time, and was and still is only a process. The single valves described in Copson’s original application were not patentable because they were ‘known art’ other than a process. Copson was a saturation-diver, but Peter was not. In fact Peter knew little or nothing about diving or the control unit he and Alex were involved in. No-one, in Helinaut Ltd or Trimay Engineering Ltd had sufficient knowledge to design a simple single valve that worked. So they approached an engineer (a capstan turner) called Mr Wade of 16 Mill Street, Dalbeattie, Kirkcudbrightshire, Scotland and asked him to make them a valve. In a recorded telephone conversation with Wade in 1977 (which I still have) he tells me the story of the ‘nice boys’ who were ‘not engineers’. Wade explained that he had to draw and make two of the single action valves out of brass. Copson’s application for the patent used several single valves in what was a ‘process’. Copson made two further updates to the first application, dated: First 16th February 1976 Patent application Number 6042/76 single valves only. Second, 26th February 1976 Patent application Number 7671/76 single valves only. Third, 13th May 1976 Patent application Number 19787/76 still single valves only. I had spent fourteen years in scientific and medical instrument making with the last eight years at Vickers Medical (through the various company name charges). I possessed knowledge of and skills in diagnostics and the modification of numerous instruments including Vickers Medical venturi breathing masks. I had applied for a junior draughtsman post at Trimay for the one gap-year between college courses as mentioned before. My interview was 7th July 1976 at which I was told that I could keep the copyright in all of my drawings to use in my portfolio for use the following year. Over a period of several months, under instruction of the buyer, I had been given the job of purchasing parts from specialised manufacturer’s catalogues. The job of buying was then delegated to me to obtain items specifically requested by my Manager Mike Bull. No-one went into detail about the project other than the parts were for the gas control panel. 25th February 1977 I returned to work late in the evening to collect some instruments that I had earlier forgotten to take home, to discover lights coming from a disused building on the Trimay site. This was in an area which I had been informed was not in use by the company. Because this was unusual, I opened the door of the building to discover six or more people working on what looked like the assembly of the control unit I had been told did not yet exist. They were very annoyed I had found them working, however, it was extremely lucky for them that I had, because two large bins had been designed and made at Trimay and were fitted inside the control unit. I asked what were they for and I was told they were filter bins. I asked if they were working at ambient pressure and was informed that they would be working at 1 atmosphere (atm) below diving pressure. I took that to be a joke but it was repeated to me. I pointed out that the 6 mild steel bolts holding the lid on the filter at diving gas pressures would either cause total gas loss or injure the diver. I explained to the Trimay senior draughtsman Richard Fitch who designed the bins, that the construction of the bins was totally inadequate and if filled with Carbosorb the moisture in the gas returned from the diver would condense and produce a slurry which would attack the cast iron bins producing contaminated gas to be returned to the diver which could injure or kill him. They should have been glass-lined bins. The following week the managing director offered to put me in charge of producing the second control unit, but he wanted me to design a bypass for the first unit. I have enclosed a copy of my drawing of the bypass both before and after it was sent to Lloyds (offshore insurance) for vetting and stamped approval with only my signature on the drawing. I had been handed two small tubes and asked by Fitch if I could see why the Wade valve did not work. I said I could, I was told the tubes were nozzles. Fitch then asked me if I could make the valves work. I said the tube was not the correct type of nozzle it acted as a tube. I drew a “venturi” nozzle, Copson’s patent agent’ s tracer’s copy of my drawing can be seen in Copson’s complete specification as the single valve. We took my venturi design to a small engineering firm in Thetford who allowed me to make the nozzle myself. This was because Trimay had no lathes that were small enough to complete this process, as theirs had been purchased from the Coal Board and were huge. I had to turn the stainless steel nozzle to ensure I obtained the exact internal shape I wanted. I made two of the nozzles both with the 3mm bore. During one lunch break I was walking around the Trimay site and looked into a very large unused hanger to discover in the gloom several items I did not expect to see. You will see from the photos that Helinaut had a test set-up. There were two small tables, a pressure vessel with a top tower, two sets of Copson’s gas bottles, the control unit, a very large gas compression unit and a small caravan. Copson’s free-flow helmet was on one of the tables. I have photographs of both of the Wade valves fitted to the free-flow helmet, but the valves did not work at all until my modification. I was present during the test of my nozzles fitted in the Wade valves, they worked well. Over the Christmas 1976 holiday I thought about how a diver works and decided to design a safe exhaust valve that did not require any diver input. I designed two independent valves that would work in unison having a joint exhaust connected to a return hose at 1 atm lower pressure. I designed the valve to work on any return system that could maintain 1 atm lower pressure. I took the general arrangement drawing to work as a speculation. I was led to believe Helinaut were not interested in my conjoined valve. I left Trimay and returned to college and pursued my teaching career gaining a rare teaching double (qualification). Unfortunately I was involved in an accident leaving me unemployable. Nine years later I discovered Copson had copied my conjoined valve design claiming he had invented it. It was approximately nine years later when I saw an out of date business magazine in my newsagents. It contained an article, which I have copied for you. It tells one of three versions of the Gas Services Offshore story told by Don Rodocker. I noted how the valve on the helmet pictured looked, and the description of its function was remarkably like that of my valve. I wrote to Rodocker explaining about none payment for my Helinaut “logo” graphics and that I had designed the Helinaut valve and not Copson. He asked for more details, so to keep it confidential I sent my second letter to his home address. Rodocker not only failed to reply to my second letter, but this is when his deception began. At first I had believed him innocent of any knowledge of Copson’s theft, but what followed proved I was wrong to believe he had any honour, he could not be trusted either. I obtained sealed copies of Patent Office publications and certified copies of Court documents that fully explained why Rodocker had been silent. There is evidence of Rodocker’s own indictable offence plus perjury but when this evidence is added to particular facts that you have on your web-site bears out there having been a conspiracy to deceive the British Patent Court into altering Copson’s patent to make it legal. The attempt failed and the case was stopped by order of the Court without being heard. However, Divex employees were told that Gas Services had won the case and Krasberg gave over his company as settlement. I do not accept that story and I am pleased your site tells another version of the story. Krasberg’s patent, never breached Copson’s illegal patent, and remained fully legal so why would he have given over his company? Unbelievably, shortly afterwards the entire Patent Office patent file mysteriously disappeared and it was never reconstituted by the Patent Office either. So the first three patent applications could not be challenged. However, the application contents remained in the complete specification with the new, copied designs, which they had hoped included, but they were not. That is why Rodocker planned and made the attempt to deceive the Court into legalising Copson’s false patent. To put this whole story into perspective, it started with discrimination, deceit and dishonesty of the three individuals at my interview at Trimay. It continued until I sent my invoice to Helinaut requesting my costs and payment for producing the artwork privately for the Helinaut labels seen in my photographs. I was surprised to receive a letter from Hamilton-Davis on Helinaut headed paper, adding insult to injury by refusing to pay me on the grounds that Helinaut had no contract with me. The Helinaut letter is proof that Copson definitely had no rights to my conjoined valve design. Therefore, Gas Services Offshore, Pressure Products and Divex are not entitled to copy and profit from my concept without a licence or assignment from me. From details supplied by Gas Services Offshore the Helinaut copy of my conjoined valve and Helinaut control unit was installed and tested in 1977 on Oceaneering vessel ‘Constructor’. Gas services supplied full details of the first seventy valves sold. I have to advise you that the copyright on my conjoined concept, the so-called “Helinaut” valve comes under the 1949 Copyright Act protecting my design for seventy years after my death anyone making a copy of my concept is in breech. I am proud of the fact that my conjoined valve has proved to be a substantial success serving the international oil and gas industries, The Royal Navy in the Faulklands and numerous Navy services around the world and was used in the recovery of the Kursk. I would be very happy to speak to you about the history further if you are interested. Finally, you maybe able to help me. If you have a photocopy or cut-away of any of the recent Ultrajewel designs 603 or subsequent others, could you let me know who the publishers are as I would like to obtain a copy. Since my website survived other websites in the past where these other websites deleted their content (and my website still had listed the link to this content) I just took some screen shots of the Daily Mail website where the story on Alex Copson (the patent holder of the Helinaut helmet) was published. See screenshot here below. I try to stay out of politics with this website but when the patent owner of the deep diving helmet which is currently used by most of the (western) off shore diving companies seems to be involved in some high level notorious dealings and is even blamed to have stolen the very idea of the actual techniques (Helinaut-Valve) which is used on this deep diving helmet then I think that the story is worth publishing on this website.